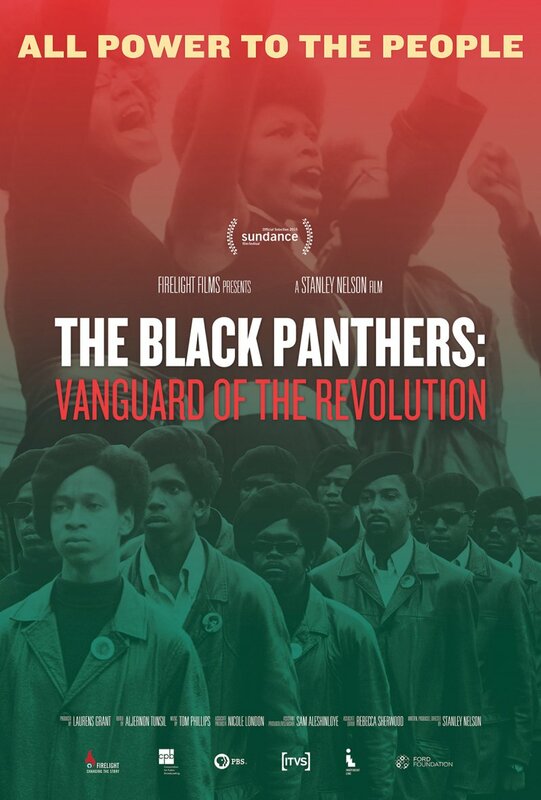 Black Panther Party: Vanguard Of The Revolution hit the big screen at Hackney’s Rio Cinema during the East London Film Festival and was joy to behold. It is now poised for nationwide release. 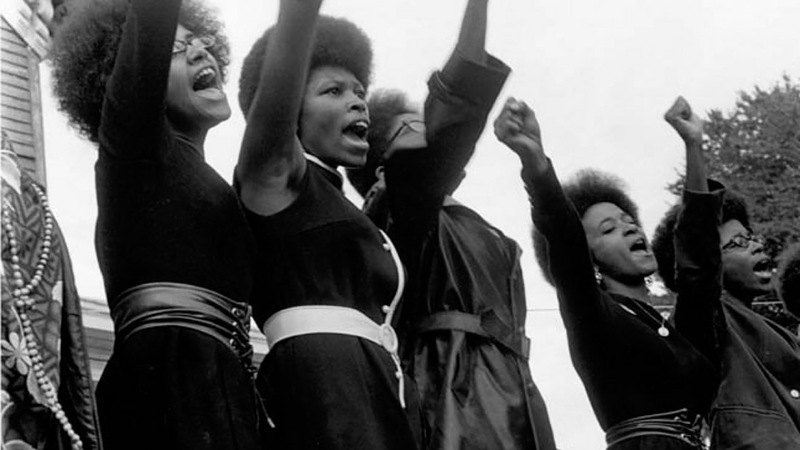 In the shadow of on-going institutionalised police brutality and the Black Lives Matter campaigns across America the legacy of the Panthers remains both inspirational and deeply relevant. Back in 1969 I picked a copy of Bobby Seale’s book Seize The Time. The cover had a clenched fist inside a black leather glove, a sartorial style that the Twisted Wheel generation of soul devotees had adopted post Tommy Smith and John Carlos’ Black Power salutes at the 1968 Mexico Olympics. 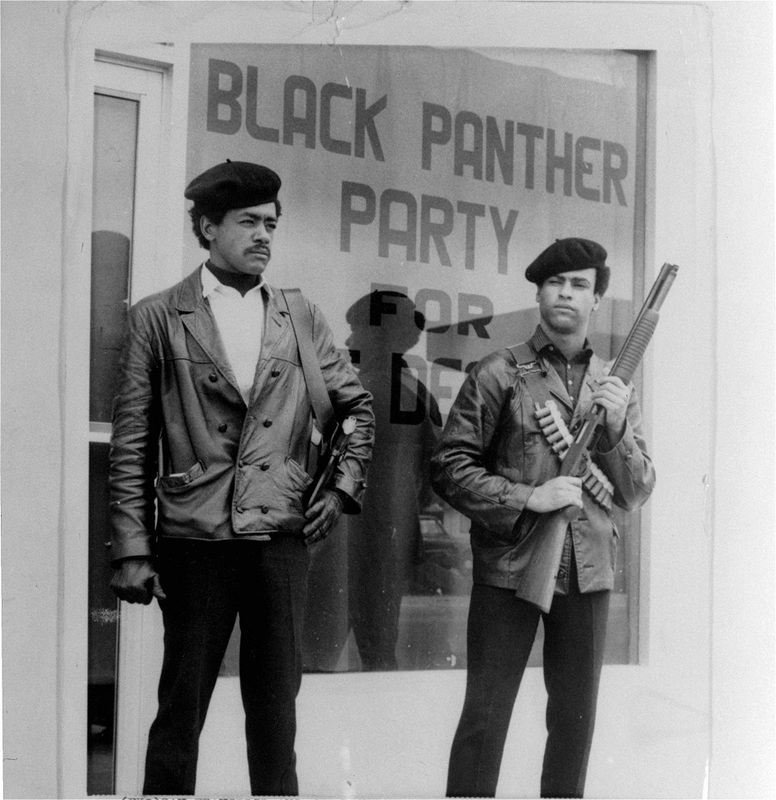 Bobby Seale and Huey Newton had founded the Black Panther Party for Self Defence in Oakland California in October of 1966 in response to ongoing police violence against the black community and Seize The Time told the story of the impact that their stand off with the US power structure had. I wanted to know more and upon moving to Cheltenham I discovered a small shop at the back of Cavendish House (the town’s equivalent of Harrods) run by an African who sold the cane chairs like the one Huey Newton was photographed in brandishing a spear and rifle. He also sold literature by Eldridge Cleaver (Soul On Ice), Angela Davis (If The Come In The Morning) and Franz Fanon (Wretched Of The Earth). 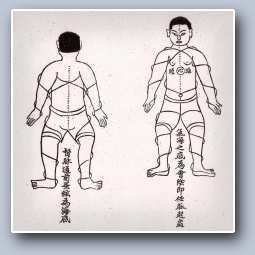 My education continued. As now, the world was in a turbulent state at the end of the Sixties. The Peace & Love generation of American youth were confronted with the draft to fight in Vietnam. The dream of Civil Rights ended in Memphis in 1968 with the assassination of Dr.Martin Luther King and the baton was passed a new generation who that responded to America’s endemic violence against its black citizens with a call for revolution. The vanguard of that movement became the Black Panther Party. Previous efforts to document the story of Black Panther Party have all too often been concocted from scattered repackaged parts, often depicting tragic, mythic accounts of violence and criminal activity. That’s not the case with documentarian Stanley Nelson. The man goes straight to the source, weaving a treasure of rare archival footage with the voices of the people who were there: police, FBI informants, journalists, white supporters and detractors, and Black Panthers who remained loyal to the party and those who left it. 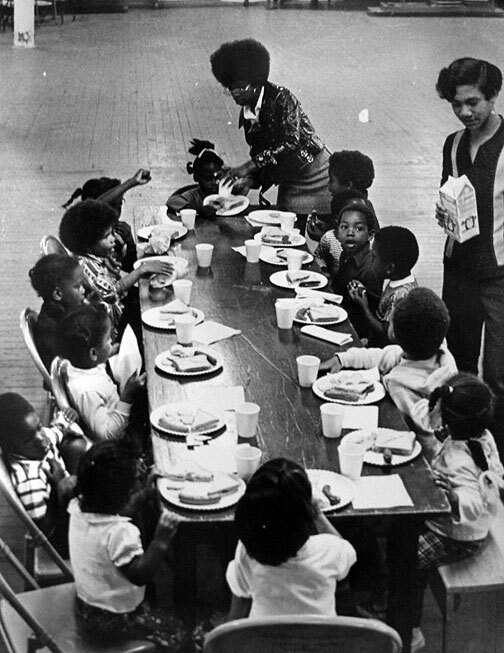 Black Panther Party: Vanguard Of The Revolution is not intended to be definitive but what we do get is an essential history. The bold arrival of the heavily armed Panthers at the California senate and the response then governor Ronald Reagan is classic. We get to witness Bobby Seale standing for mayor of Oakland and the impact of the breakfast programmes in the ghetto. They were masters of getting their own publicity and the Panther newspaper with the explosive graphics of Emory Douglas made a huge impact. The FBI had already initiated a covert action program – Cointelpro – against Martin Luther King Jnr, Malcolm X and Stokely Carmichael and in 1969 Hoover moved against the Panthers. While toll of arrests and deaths rose it was left to women activists like Kathleen Cleaver, Ericka Huggins and Elaine Brown to lead the struggle and provide inspiration for a whole generation of women to get involved.. 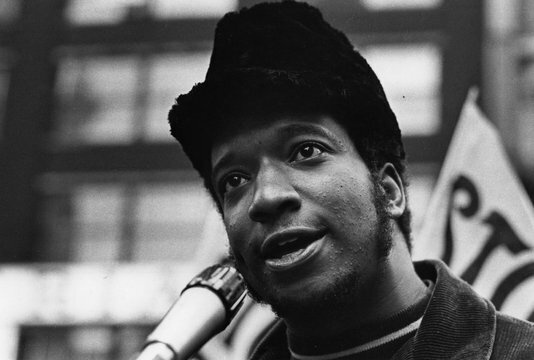 The assassination of Fred Hampton, the chairman of the Illinois chapter of the Black Panther Party is thoroughly documented in the film. It was clear that the charismatic Hampton, a born leader who had cut his organisational teeth with the NAACP, was perceived as major threat by the FBI. Word is that Hampton was on the verge of a merger between The Panthers and a 1000+ strong gang on the Southside of the Chicago. He was murdered while sleeping in his apartment during a joint police/FBI raid. Through J Edgar Hoover and the FBI, the weight of the American “justice” system was directed against the Panthers. It was a protracted war aimed at destroying their infrastructure with arrests and killings that eventually succeeded. Though Huey Newton was eventually freed from prison after a long campaign it appeared from the film that the brothers who surrounded him on his release were not from the daily struggle but associates from his jail time. In Eighties Newton studied at the University of California where earned a PHD for ‘War Against the Panthers: A Study of Repression in America’ – it was eventually published by Harlem River Press. He reputedly succumbed to cocaine addition and died in a confrontation with a local drug dealer and member of the Black Guerilla Front in 1989. Eldridge Cleaver, proved himself an politically corrupt opportunist but Bobby Seale, Emory Douglas, Ericka Huggins and Elaine Brown, among others, carried on their work in the community. They left a lifeline of activism to those today who choose to campaign for change and to resist police forces across America, that equip themselves with the second hand armaments from failed US wars in Afganistan and the Middle East. The Black Panthers: Vanguard of the Revolution, is a vibrant, human, living and breathing chronicle of a pivotal movement in global history. If you get the chance to see on a big screen, don’t sleep on it. 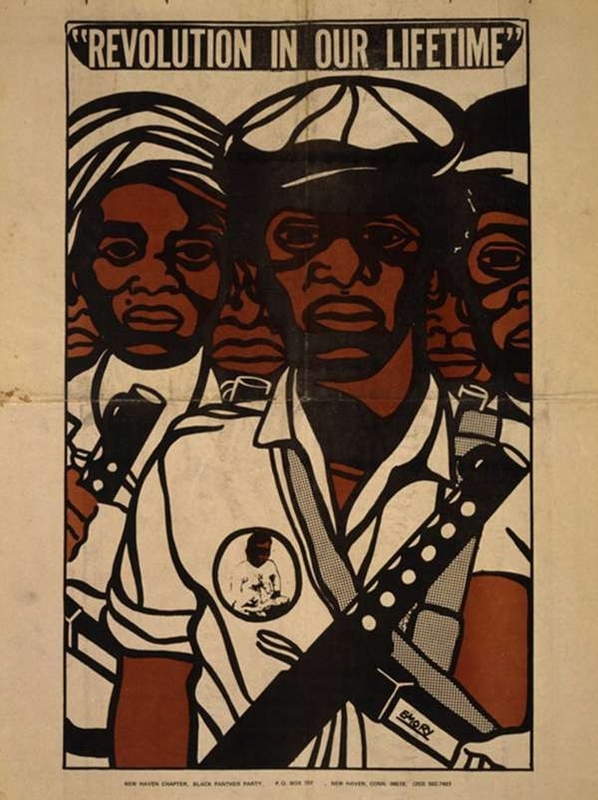 This entry was posted in Deep stuff and tagged Black Lives Matter, Black Panther Party - Vanguard Of The Revolution, Bobby Seale, Cointelpro, documentary, East London Film Festival, Film, Fred Hampton, Huey Newton, Stanley Nelson. Bookmark the permalink.